MacKenzie Commercial Real Estate Services, LLC is proud to announce the sale of Annapolis’ Third Street Marina, located in the historic Eastport, at 310 – 312 Third Street, Annapolis, Maryland 21403. The property consists of an expandable, 10-slip marina with travel lift, a 3,512-square-foot, two-story waterfront office building, and the 4,160-square foot O’Learys Seafood, one of Annapolis’ finest restaurants. This project provided a great opportunity to invest in a rarely available asset along Annapolis’ waterfront, unquestionably one of the nation’s premier real estate markets. The property’s size, coupled with the tenant diversity and unparalleled location on Spa Creek in Eastport will ensure that this location remains forever desirable to boaters, diners and office users alike. Tim Jaeger and Todd Bosley of DANAC represented the buyer in the transaction. 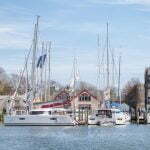 “The Third Street Marina is a unique and eclectic real estate investment property that has enjoyed solid upscale tenancy over the years and will continue to be one of the most sought-after maritime addresses in Annapolis,” stated Farrell. For sale and leasing inquiries, or additional information on this project, please contact Scott Wimbrow at swimbrow@mackenziecommercial.com or (410) 953-0354, or Trish Farrell at tfarrell@mackenziecommercial.com or (410) 974-9003.